If you wake up every morning, no matter the season, with irritated eyes, a stuffy nose, and constant sneezing, you may actually be allergic to your mattress. To get technical, it’s not usually the actual mattress itself that you’re reacting to; it’s what is living inside of your mattress that is causing mild to severe allergy symptoms each morning. Are There Living Creatures in Your Mattress? You read that right: dust mites are miniscule bugs that thrive in many mattresses. However, the dust mites themselves are relatively harmless. What allergen-sensitive sleepers actually react to are dust mite feces. Dust mites feast on the skin cells shed by humans, of which there is a great concentration left behind in your bed each morning. Coupled with moisture, which we produce as we breathe in and out each night, dust mites find comfortable homes burrowed inside of your bed. Additionally, this moisture can contribute to the growth of mold and mildew within your mattress, which are also known allergens. The most common allergies from mold, mildew, or dust mite excrement includes nasal congestion, which can range from mild to severe and typically improves as the day goes on. Other mild reactions include watery eyes, sore throats, and itchy skin. However, people who are especially sensitive could develop coughs, shortness of breath, headaches, and wheezing. Unfortunately, cohabiting with dust mites is simply a fact of life. It’s nearly impossible to completely eliminate them. However, there are a few things you can do to lower your contact with dust mites in your home. Make sure your bed frame is made of wood or metal; this lessens the chance that dust mites, mold, and mildew can thrive in soft materials. Always wash your bedding, once a week, in hot water to kill any dust mites living in them. Regularly clean your bedroom, especially the carpet and rugs. Hypoallergenic mattress is a bit of a misnomer – there’s no mattress that is specially made for all types of allergies. However, there are many different types of mattresses and some of them are more suitable for people with certain types of allergies. Memory Foam and Other Foam Mattresses. When a sleeper faces dust allergies, consider a memory foam (other other type of foam) mattress. Since the foam offers an undesirable environment for dust mites, they simply cannot live or thrive in a foam mattress. For individuals suffering from allergies to chemicals, pesticides, or dyes, organic and all-natural cotton may be a good choice. However, cotton produces dust, which may be problematic for individuals who suffer from dust allergies. Wool is another naturally anti-bacterial material, making it completely resistant to the development of mold and mildew. When moisture gets on wool, including moisture from the sleeper’s exhale, it rapidly evaporates and leaves a dry environment that is uninhabitable for dust mites. Organic or all-natural wool is another great option for people with allergies to chemicals or scents, but like cotton, produces more dust than foam. A dust cover may be a great all-in-one solution for individuals with many different types of allergies. For example, an individual who has allergies to dust and sensitivities to chemicals can use a dust cover on a cotton or wool mattress to get the benefits of a chemical-free and dust-free sleeping surface. Allergy sufferers who are seeking a hypoallergenic mattress have a wide variety of options available. Contact Gardner Mattress to learn more about hypoallergenic mattresses and take control of your allergy symptoms. 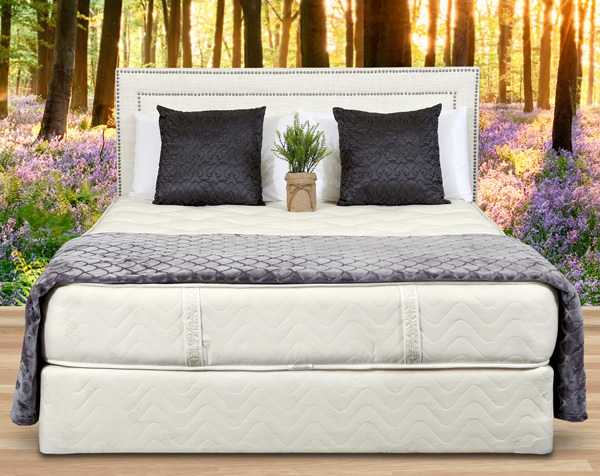 Next article	What is the Difference Between a Mattress Pad & a Mattress Topper?